Katarina Comforter Set provides an eye-catching update to your bedroom. The textured ground has small grey circles on a white base creating dimension on the solid base. The floral medallion motif runs up the center of the bed and spreads across most of each sham. A fuschia ruffled decorative pillow and embroidered leaf pillow put the finishing touches on this unique design. Set includes one comforter, two matching shams(one in Twin/ Twin XL), two decorative pillows. Randomly decided to look on here for a comforter for my apartment and came upon this. It is absolutely perfect!! The extra pillows are not my style but I gave them to my sister. The comforter looks distressed on the print In a good way in person and the white section has little grey circles. 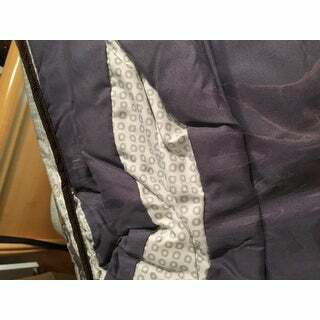 The inside of the comforter is a beautiful purple color for when you want change. The comforter feels like every other comforter and will keep you warm. I purchased two twin sets for my girls room. They loved the pattern and the peacock accent pillow. The material is lightweight, so perfect the the summer months. Will purchase again! The box was a little beat up, however, the set within it was in perfect condition. Love this set; I purchased this for my college apartment. It looks just as pictured online and its quality is great as well. I really like that the comforter is reversible with the pattern on one side/ solid color on the other for some diversity. I'd definitely recommend this product to anyone looking for a new comforter. So comfortable my kids want to sleep with me! The colors are as vibrant and fantastic as pictured. This set is so pretty and vibrant! It came with 2 small pillows, 2 pillow cases, and the comforter (I purchased the two big pillows separate to fill the pillow cases separate). Shipping was fast and easy, I had no issues. I just moved out and purchased a memory foam mattress from here as well (best nights sleep ever). Very happy, Overstock is my favorite place to shop! I received this comforter set yesterday, overall its a nice looking comforter but did not meet my expectations. First of all, if you look closely at the comforter on this website it's all white with a textured pattern not little grey circles like I received. The colors aren't as vibrant as in the picture. Even though it looks nice, I might return because I was really looking forward to receiving a white comforter with vibrant colors in the center as pictured. Love the beautiful color display. The colors are vibrant just as pictured. The comforter is nice and fluffy. This set was perfect for my teen daughter’s dorm room. The included accent pillows were a definite plus. I love it! The colors are true to the picture and goes well in my room against my purple accent wall. The quality it pretty good. I love that it comes with two throw pillows and the comforter itself is very soft. This turned out to be a really nice set for my daughter's room. Everything is as shown in the pics. I didn't expect the gray circles where it looks white but still very pretty. This is a beautiful bed set! The Katarina set is lovely for my daughter's room. She is 8 and beyond the juvenile comforters with characters. This will last her through her transition years. We washed already in the washer/dryer and it held up beautifully. The pillows are a great added bonus. Really pretty addition to my guest room. I like the mix of purples and blues, it's very soothing. Material is fine for the price. It's not the softest, but it's not scratchy either. Bought for my daughter's college apartment. Perfect for what she needs! "Is this a comforter or a quilt? I thought I was searching in the quilt section but this says comforter." "I am a little nervous because of the polyester. is it shiny?]" Hi, it's not shiny. It looks very nice on my bed and does not look cheap. Definitely matte, not shiny. Has a soft smooth feel. Colors are vibrant. It is well made with a higher end look. Not cheap at all . "It says the color is purple but all the pictures look like it's mainly gray. Is it really purple?" Yes, the color is purple. Color is open to interpretation. Please remember, due to the difference of monitor colors, the colors on some of our items may vary slightly. Thank you. Chosen by my 14 yr old granddaughter. I love the colors & design. Will hopefully go perfect in my newly renovated bedroom.